A few days ago, we talked about CyanogenMod 7 port for Kindle Fire. A young developer who goes by the name of JackpotClavin came up with it; he posted two photos which showed a pre-alpha build of CyanogenMod 7 running on the Kindle Fire but did not release the required files, that is until today when he updated the official thread over on XDA. Check out our step-by-step guide on how to flash CyanogenMod 7 on your Kindle Fire after the jump! Before you get started, you must understand that CyanogenMod 7 for Kindle Fire isn’t very stable yet. It would be recommended to wait until the ROM is properly tested and confirmed to be working before taking risks. It has been tested only for Kindle Fire Software Version 6.0 and 6.1. Besides this, currently there is no way to revert back to stock firmware. You will basically lose all of the Kindle Fire’s integration with Amazon’s services. You will, of course, also void your warranty. With that formality out of the way, let’s get down to business. Step 1: Root your Kindle Fire. Step 2: Download CyanogenMod 7 [MediaFire] and place it at the root of your Kindle Fire’s sdcard so that its address is /sdcard/update.zip (this is very important). Similarly, download ClockworkMod Recovery [MediaFire] and place it to root of sdcard as well. If it say “bootmode has written”, type “reboot” to, well, reboot! Your Kindle Fire will now boot into ClockworkMod Recovery (CWM). Step 5: Press Power button on your Kindle Fire so you can install update.zip from sdcard. /system, /data and /cache will be wiped automatically. JackpotClavin modified CWM so that it would work with the Kindle Fire’s lack of buttons, so basically you just have to press the Power button a bunch of times. In one of the menus, it’ll look like you have to scroll down to Yes. Instead, you must press No but it will, as the developer says, “mimic you pressing Yes”. 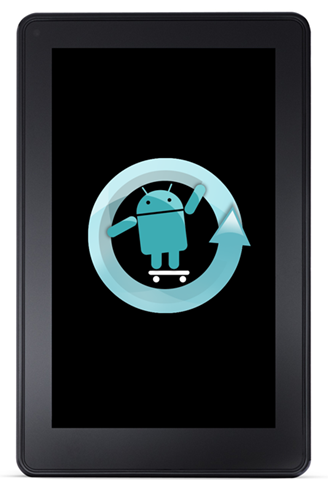 If you followed the steps correctly, your device will reboot into CyanogenMod 7. If you have any queries, check out the official thread over on XDA.